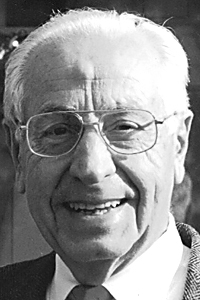 Joseph N. “Joe” DeBernardis, 94, Altoona, passed away Sunday at Maybrook Hills Health and Rehabilitation Center. He was born in Altoona, son of the late Nazzareno and Maria (Turchetta) DeBernardis. On May 9, 1946, he married Italia Dente, and she preceded him in death on July 11, 2012, after sharing 66 years of marriage. Surviving are a daughter, Juliet DeBernardis in Florida; a son, Joseph DeBernardis (Sylvia) in Arizona; six grandchildren; 18 great-grandchildren; four great-great-grandchildren; a sister, Sylvia Dinardo of Altoona; a brother, Deacon Thomas DeBernardis in Illinois; many nieces and nephews; and two sisters-in-law: Irene and Anna DeBernardis. He was preceded in death by a sister, Celeste; and two brothers: Benedict and Leonard. Joe was a 1940 graduate of Altoona High School, and he continued his education in drafting and design. He was a veteran of the U.S. Army Air Corps, having served as an aviation cadet during WWII. In 1986, he retired as an equipment designer for Phillips GTE, where he received two proprietary awards and developed four patents. His knowledge and work experience in his field gave him the opportunity to travel to many foreign countries, including Brazil, Italy, the Netherlands and Mexico. He was a member of our Lady of Mount Carmel Catholic Church, Altoona. He was also a grand knight for Knights of Columbus in New York, and he was a faith navigator of the fourth degree. Friends will be received from 3 to 7 p.m. Wednesday, Feb. 8, 2017, at Santella Funeral Home, where a vigil for the deceased will be held. A funeral Mass will be celebrated at 10:30 a.m. Thursday, Feb. 9, 2017, at Our Lady of Mount Carmel Catholic Church, Altoona. Committal with military honors will be at Calvary Mausoleum, Altoona.